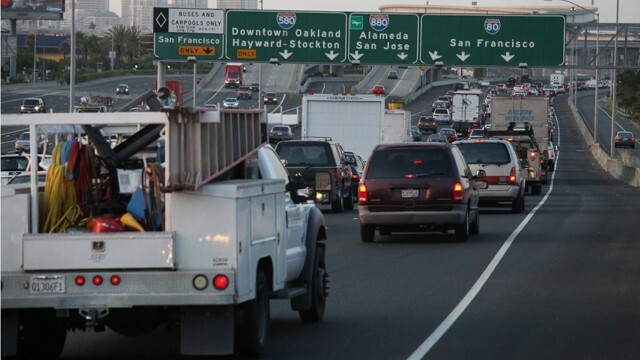 Three new monitors to measure vehicle emissions are going up this year at congested traffic corridors in the Bay Area. They're the result of a new federal law requiring local governments to keep tabs on emissions in heavily trafficked areas. The Bay Area Air Quality Management District will oversee and manage the monitors, which will cost between $250,000 to $500,000 each. “Populations near roadways are more affected and have higher rates of asthma and other respiratory illnesses,” said Eric Stevenson, the technical director of the Air District. “Because of that we want to gather data near the roadway and determine which compounds might be responsible for those increases in health effects.” Stevenson said regulating those emissions is an important tool for public health policy. The federal regulations require three compounds to be monitored: nitrogen oxides, carbon monoxide and small particulates. But the Air District plans to track other emissions, too. “We the Air District have decided that it makes a lot of sense to try and measure as many different types of compounds as possible,” said Stevenson. So the district will measure hydrocarbons, ultrafine particles and will conduct an analysis to discover other compounds that may come from emissions. Monitors will be placed at Laney College in Oakland by Interstate 880 and along Interstate 80 in Berkeley, west of Aquatic Park. The third monitor will be in San Jose, south of the interchange between Interstates 280, 680 and Highway 101. Emissions to be monitored on major Bay Area roadsRight now, the Bay Area Air Quality Management District has a system of more than 30 monitors throughout the nine Bay Area counties to measure air pollution in general areas, but none is located close to a busy traffic corridor. As a result, environmentalists say, the system overlooks the risks to people who, like tens of millions of Americans, live within 300 feet of major roads.